Light Duty Cantilever Racks - "QuikTree"
This rack features arm adjustment, two brace lengths, end stops that mount up or flush, and a selection of single column or double column units to provide flexibility for multiple storage combinations. Two width options - 3 feet or 6 feet. Up to 7 pairs of adjustable arms per side (28 total arms for double column). 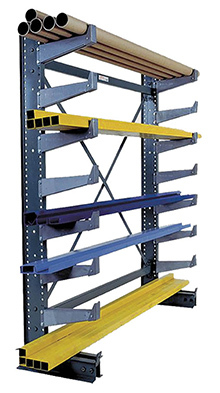 Let us help you configure exactly the right cantilever storage rack.